We've had a couple of reports of large numbers of elm sawfly larvae in Kankakee and Iroquois counties. 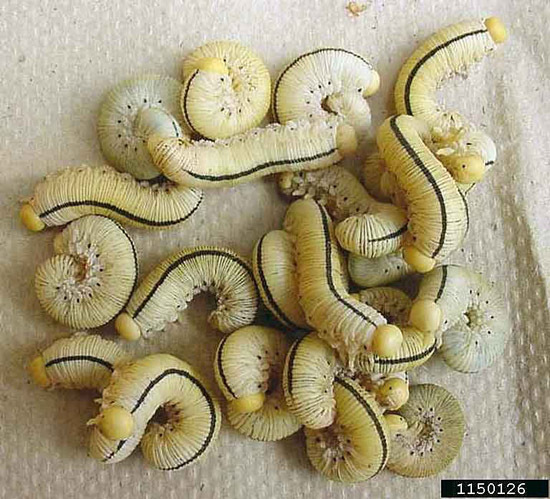 These yellowish to white larvae are thick-bodied and approach 1-1/2 inches long when fully grown. They have yellowish heads and a black line running down the middle of their backs with a row of brown to black spots on each side. They are usually curled up on a leaf when discovered. These insects feed on elm and willow, and we are finding most of them either on willow or walking across the ground towards willow trees. They can cause considerable defoliation on their hosts.